The Roman Rite Anointing of the Sick, as revised in 1972, puts greater stress than in the immediately preceding centuries on the sacrament's aspect of healing, and points to the place sickness holds in the normal life of Christians and its part in the redemptive work of the Church. Canon law permits its administration to any Catholic who has reached the use of reason and is beginning to be put in danger by illness or old age, unless the person in question obstinately persists in a manifestly grave sin. "If there is any doubt as to whether the sick person has reached the use of reason, or is dangerously ill, or is dead, this sacrament is to be administered". There is an obligation to administer it to the sick who, when they were in possession of their faculties, at least implicitly asked for it. A new illness or a renewal or worsening of the first illness enables a person to receive the sacrament a further time. The ritual book on pastoral care of the sick provides three rites: anointing outside Mass, anointing within Mass, and anointing in a hospital or institution. The rite of anointing outside Mass begins with a greeting by the priest, followed by sprinkling of all present with holy water, if deemed desirable, and a short instruction. There follows a penitential act, as at the beginning of Mass. 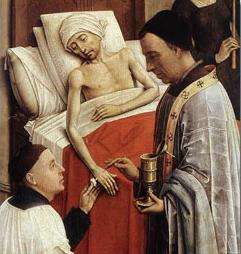 If the sick person wishes to receive the sacrament of penance, it is preferable that the priest make himself available for this during a previous visit; but if the sick person must confess during the celebration of the sacrament of anointing, this confession replaces the penitential rite A passage of Scripture is read, and the priest may give a brief explanation of the reading, a short litany is said, and the priest lays his hands on the head of the sick person and then says a prayer of thanksgiving over the already blessed oil or, if necessary, blesses the oil himself. Unction in the Greek Orthodox Church and Churches of Hellenic custom (Melkite, Antiochian Orthodox, etc.) is usually given with a minimum of ceremony. Anointing may also be given during Forgiveness Vespers and Great Week, on Great and Holy Wednesday, to all who are prepared. Those who receive Unction on Holy Wednesday should go to Holy Communion on Maundy Thursday. The significance of receiving Unction on Holy Wednesday is shored up by the hymns in the Triodion for that day, which speak of the sinful woman who anointed the feet of Christ (Matthew 26:6-16). Just as her sins were forgiven because of her penitence, so the faithful are exhorted to repent of their sins. In the same narrative, Jesus says, "in that she hath poured this ointment on my body, she did it for my burial" (Id., v. 12), linking the unction with Christ's death and resurrection. Some Protestant US military chaplains carry the Roman Rite version of the Anointing of the Sick with them for use if called upon to assist wounded or dying soldiers who are Catholics. The Catholic and Orthodox Churches consider invalid as a sacrament the administration of Anointing of the Sick by such chaplains, who in the eyes of those Churches are not validly ordained priests. The rite performed by them is thus seen as having the same by no means negligible value of any other form of prayer offered for the sick or dying. ↑ P. J. Hartin, Daniel J. Harrington James -- 2003 Page 267 "Anointing of the sick was a customary practice in both the Hellenistic and Jewish worlds. The use of oil for healing purposes is referred to in the writings of Hippocrates: "Exercises in dust differ from those in oil thus. Dust is cold, oil is warm." ↑ John Lightfoot Horæ hebraicæ et talmudicæ: Hebrew and Talmudical exercitations Volume 2 - Page 155 "On the ninth day of the month Ab, and in the public fasts, anointing for dress is forbid ; anointing not for dress is allowed." [Hebrew text] They anointed themselves often, not for excess, or bravery, or delight, but for the healing of some disease, "
1 2 3 4 5 6 7 Oxford Dictionary of the Christian Church (Oxford University Press 2005 ISBN 978-0-19-280290-3), article "unction"
↑ Apostolic Constitution Sacram Unctionem Infirmorum, Catechism of the Catholic Church, Code of Canon Law, Directory for the Application of Principles and Norms on Ecumenism, motu proprio Summorum Pontificum, etc. 1 2 3 4 5 6 Catholic Encyclopedia (1913): article "Extreme Unction"
↑ Unction of the Sick; etc. ↑ "The anointing of the sick can be administered to any member of the faithful who, having reached the use of reason, begins to be in danger by reason of illness or old age" (Code of Canon Law, canon 1004 §1). ↑ Lutheran Service Book: Pastoral Care Companion (PDF). Concordia Publishing House. 2007. ISBN 0-7586-1225-7. 1 2 "613 Administering to the Sick", LDS.org Gospel Topics. ↑ "Priesthood Ordinances and Blessings". Family Guidebook. Salt Lake City, Utah: The Church of Jesus Christ of Latter-day Saints. February 2006. Retrieved 2009-09-21.